The blackberry bush at the end of the garden is looking lovely, we have had great year for them. I’ve been seeing lots of blackberry eton mess recipes for a while and I thought I’d give it a try, but in a much more speedy way. I sweetened some creme fraiche to taste with icing sugar, added in half the blackberries and mushed them up a bit. 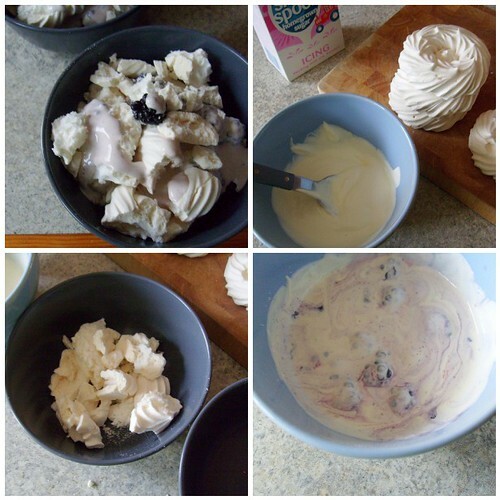 Then I broke up a couple of meringues (I buy ready made from the bakery section, they taste just as good without the hassle), spoon over the creme fraiche and the other half of the fresh blackberries – eat with a big spoon! To make this even quicker you could even use ice cream. Marscarpone works well in place of creme fraiche too.